When Russia filed the 2018 World Cup bid to FIFA, Nizhny Novgorod was supposed to get a stadium on Pecherske Peski, an island east of the city. However, this location proved unreasonable as it would have required entirely new infrastructure, including no fewer than two bridges. That's why in 2012 it was decided to relocate the venue to Strelka. 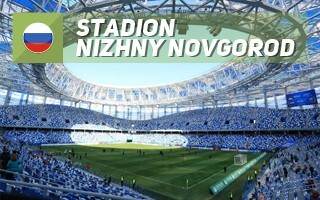 Located centrally in Nizhny Novgorod at the site where rivers Volga and Oka meet, the stadium received natural exposition in the city's landscape. At the same time, proximity to the historical Alexander Nevski Cathedral demanded a dignified architectural response. It was decided that natural themes of water and wind will serve as inspiration. In terms of colour theme it was to match FK Volga, the football team which, ironically, went bankrupt before the stadium opened. The 21.6 hectares of land was earmarked only for the stadium and surrounding parking sites, although with a large public recreational complex to be created in heritage mode. The stadium itself is elliptical, though incorporated into a circular footprint. Circle enables the creation of whirlpool-inspired aesthetics, beginning from 20 staricases leading to the public promenade and further cascade stairs. Also the white-blue membrane facade and polycarbonate roof are whirling around the center of the stadium. Initially even the seating layout was to resemble a whirlpool, but it was eventually replaced with a more conventional mosaic. In engineering terms the roof structure is by far the most interesting. Supported by a stunning number of 132 columns, it's divided into two rings of supports. The outer ring has 88 trihedral monolithic columns, while hidden inside are 44 additional inner columns. Together with thick trusses the structure weighs well in excess of 10,000 tons, having reached 9,884 t even before the polycarbonate cladding was added. We should mention that the roof surface of 54,700m2 makes the canopy among the largest worldwide to be covered with polycarbonate. Its diameter is nearly 288 meters and peaking at 54 meters above ground it's a new landmark of Nizhny Novgorod. Compared to such intricate roof, the auditorium is painfully conventional, yet attractive. Its lower tier offers 21 rows, while the waved upper tier has between 24 to 43 rows, depending on section. Together they offer some 45,000 seats at peak layout. Back in 2012 it was suggested that as many as 20,000 seats could be temporary, but eventually the entire auditorium was built as a permanent structure. The stands are hiding 5 levels of facilities. Total floor space reaches 127,500 m2, of which 67,800 m2 heated and enclosed spaces. Already in planning it was envisaged that the main stand will mostly hold the matchday facilities and vast corporate hospitality area, while football club offices, megastore and museum would be housed in the north stand. East side is earmarked for a large fitness centre and possibly other leisure destinations. Official opening in May enjoyed huge interest from the local community. The stadium was sold out, leading to a new attendance record for the entire league, with over 42,000 people. FK Olimpiyets, the successor of FK Volga, is off to a great start at the new stadium, but very few experts expect the stadium to operate without losses. Annual costs could ammount to RUB 300 million ($5 million), which might be hard to balance.